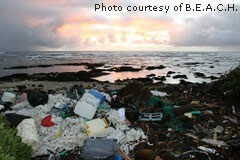 Marine debris is not just a problem in the Hawaiian Islands, but worldwide. The debris consists of a large variety of plastics (fragments of all sizes, shapes and colors), fishing equipment (nets, lines, etc.) and many other types of junk. Where does all this debris come from? Some of it comes from ocean-based sources, including ships and offshore oil and gas platforms. The rest comes from land-based sources. Debris from land may have been intentionally or unintentionally dumped or it could end up in the ocean after extreme natural events (such as tsunamis and flash floods). Once the debris is floating in the ocean, it breaks down into smaller and smaller fragments over time (especially plastics). Ocean currents wash some of the debris ashore, on islands as well as continental shorelines. Marine debris that washes up on shorelines can cause many problems. The most obvious one, the fact that it is an eyesore on beautiful beaches and can impact tourism in that area in a negative way, is just one of them. 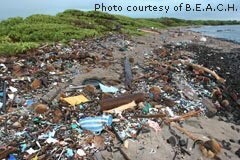 Debris on shorelines can harm coral reefs, fish and marine mammals. Turtles, for example, can get entangled in floating fishing nets. Fish, turtles and seabirds can ingest pieces of the trash, which can lead to internal injuries, starvation and death. Marine debris can also pose a navigational hazard for vessels. It can be difficult to spot and some pieces may be large enough to damage the propeller of a ship. Furthermore, plastic debris accumulates pollutants, such as PCBs (polychlorinated biphenyls) between 100,000 to 1,000,000 times the levels normally present in seawater. Because of their toxicity, PCBs were banned in the United States in 1979. After the Japan earthquake in March 2011, the resulting tsunami not only destroyed entire coastal communities, but also washed a lot of debris into the ocean. Heavier materials sank near the shoreline, but buoyant materials are still drifting in the ocean, currently en route to the U.S. West Coast and Hawaii, according to predictions by scientists. Winds and ocean currents will make this debris circle around the Pacific Ocean for many years to come. The Japanese government estimated that the tsunami swept about 5 million tons of debris out into the ocean, but that 70% of it sank immediately (leaving about 1.5 million tons floating). How much of that amount is still floating today is unknown. Some beaches in Hawaii accumulate marine debris more than others. Winds and ocean currents determine where the debris will wash ashore. Beaches that are easily accessible and that are popular among tourists are much more frequently and easier cleaned up on a regular basis than remote ones, so most tourists and even many local residents are not aware that marine debris has become more and more of a threat to Hawaii's beautiful beaches in the past few decades. Kamilo Beach on the Big Island's southeastern shore in the Ka'u District is one example of a Hawaiian beach where a lot of garbage washes ashore (though it is unfortunately not the only Hawaiian beach that is affected by marine debris). Ocean currents reliably deposit garbage along this remote stretch of shoreline. The junk originates from what is known as the Great Pacific Garbage Patch, a large area covered by drifting plastic marine debris in the central North Pacific Ocean. Some of this garbage is pushed onto Kamilo Beach and the adjacent shoreline of about 3 miles (5 km) by converging currents and prevailing trade winds. From time to time volunteers (local residents and environmental organizations, such as Hawaii Wildlife Fund and Beach Environmental Awareness Campaign Hawaii) come here and collect the garbage. Some of the items that wash ashore here are household items, as well as fishing nets, buoys and baskets. Prior to any cleanup efforts at Kamilo Beach (which began in recent years) the garbage was 8-10 feet (2.4-3 m) high in some places. Clean-up efforts in this area are not easy to organize because of accessibility issues. There is no road that leads here (one needs a 4WD), and to access it one has to cross private land. Kamilo means “swirling currents” in the Hawaiian language. The ancient Hawaiians knew about the currents here and would come to Kamilo Beach to collect large logs to be used as building material for canoes. Back then it was just natural items that washed ashore here, like wooden pieces and coconuts. It was also the place where lost-at-sea fishermen might eventually wash ashore. 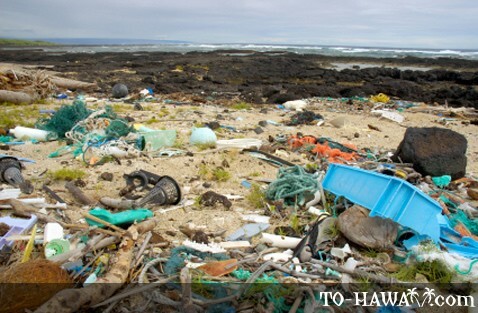 Marine debris is also an issue at other beaches in the main Hawaiian Islands, as well as in the uninhabited Northwestern Hawaiian Islands, which are part of the Papahānaumokuākea Marine National Monument, home to an extensive coral reef, marine life and a seabird sanctuary. To reduce debris reaching our oceans in the future we all must make an effort to recycle our waste responsibly, as well as reduce the amount of waste we produce. When visiting a beach, make sure to not leave garbage behind. You can also participate in beach clean-ups in your area.